Animated series. When the Riders uncover the location of Viggo's dragon auction, they must stop him from selling dragons and stealing all the gold in Berk. Browse content similar to Last Auction Heroes. Check below for episodes and series from the same categories and more! Grimborn auction? What's on the block this time? Think what we could do with our own dragon. Its hide alone! Only the richest Vikings dare to show up. -So, how do YOU know about it? Because I have this map. Got it from a gold baron. Told him I'd let him live if he showed me what it was. Don't let that out of your sight. HE SNIFFS Ah. Do you smell that, brother? But everything must go off with perfection. How is security coming along? Catapults are doubled, watchtowers are going up. No riders will spoil the auction. -See what you can do when you put your mind to it, big brother? -Any news on our special guest? -Are you sure he's coming? -I will let you know. but where are they hiding all the big dragons? Extra ships on the perimeter. Guards everywhere. Catapults and watchtowers on the cliffs. Dragon Root arrow launchers on every sea stack within a half-mile. There's no way in or out, period. Hiccup, Hiccup, Hiccup, think positive. -And how do you suggest I do that? Mug - half-empty or half-full? to put a big dent in Viggo's dragon trade. 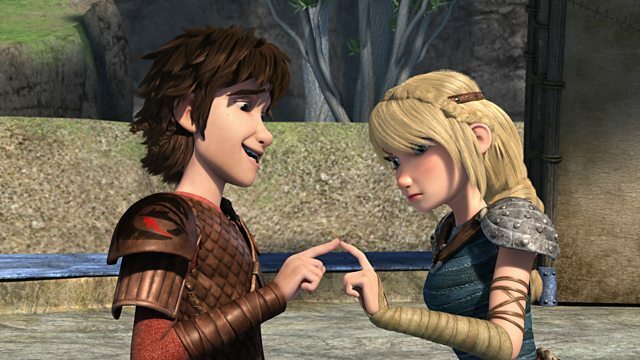 Astrid, I'm sure Hiccup has an idea. Let me guess. Cruise right into the place and announce ourselves. keep him busy while we find the rest of those dragons. because he's never seen them up close. -You've got to be kidding me. No, he's the only one who was never captured by Viggo or Ryker. He's the only one they don't know. He's the only one who's clueless enough to actually pull it off. Sounds like a real winner, Hookfang, right? I'd hate to be caught dead with that guy. I hate to be the bearer of most unfortunate news, Master Hiccup. you won't see the dragons, let alone bid on them. Oh, sure. Yeah, take Berk's entire cache of gold. -If you weren't my son, I'd lock you up right now. You've no idea what you're suggesting, Hiccup. Viggo Grimborn is the most ruthless Viking we've come in contact with. an armada of dragon-hunting ships and reinforce his empire. he will set his sights on Berk and on our dragons. Well, son, I'm assuming you didn't fly all the way here without a plan. -A special envoy, you say? -Going into the auction under an assumed identity. When I clap, that means you two servants serve me. I need you to trust me on this, Dad. It's foolproof. Fool, maybe. Proof? Not quite with you on that. Oh, don't look at me like that, son. Don't just stand there babbling to the peasants. Carry my gold. Get yourself a new axe. You? Get yourself a new tunic. Learn the name, like the name, love the name. I feel like I know you from somewhere. Do I? My brother asked you a question. Does he know you from somewhere? Ha! Does he know me from somewhere? Does he KNOW me from somewhere? Hey, does he know me from somewhere? or where you know him or don't know him from. You do NOT speak for me. Do you understand? Yes, Sir Ulgerthorpe. Please accept my humble apologies. Try getting good help these days. Boof, very hard. All right, be a good boy and tip the attendant. Come on. the man's money, now, do we? -Right, turn it around. You've no business here. You haven't the gold nor the constitution to stomach this. Well, you certainly speak the truth, Mr Ryker. I do bring your brother an offering. Get Viggo. He needs to see this. You must have misunderstood me, Mr Ryker. and be on my merry way, if it's all the same to you. Yeah, well, it's not all the same to me. Get Viggo! Mr Grimborn, what a pleasant surprise. and as an exchange for future safe passage in my trading lanes. Trader Johann, perhaps I've judged you a bit hastily. This is a splendid and most generous gesture. come to expect from the vessels in your fleet. The trade has been a bit, shall we say, sluggish lately. Off-load Trader Johann's dragons and place them with the others. any more of these harrowing moments. his best clients like this? You do realise you actually aren't a best client? I'm in character, Gobber, so, no. No, I do not realise that. Look at that big guy. -Ugliest dragon I've ever seen. Out of my way, Grump! Fat beast. Do you auction off the ugly, fat one, as well? and is the only dragon that can bite through a dragon-proof cage. Personally, I'd just as soon skin him and eat him. with some yak butter on it, eh, Grump? But Viggo likes having him around. Says there's a use for everyone. I'd like to do some business. -Is that not what we came for? -Are you waiting for my permission? out of the eyesight or earshot of your goons. This will do. Come, valet. Nobody goes inside Viggo's tent. Sir Ulgerthorpe goes where Sir Ulgerthorpe wants. Second, I need to count my gold. It's not going to count itself. I'll do it where I want! Go ahead. Count your coin, but make it quick. Can you believe that barbarian? The nerve to question my intentions! You can drop the act. We're alone. nor does he break character. He lives within. He becomes it. You know, you could be a better scene partner. It is two-sided. I'm giving of myself, and I would appreciate a return on that energy. Ooh, what's this? Looks important. Not as important as the auction manifest. Ugh, manifest, Snotlout. The list of dragons and where they are kept. I totally know what a manifest is, Gobber. And the bidding is about to begin. Now, once we find our dragons, we wait for Hiccup's signal. Yeah, then we release the rest of the dragons. We get it. -Is this guy serious? Belch! -Oi, did you hear something? We're going to get caught and thrown into a Whispering Death hole. Fishlegs, it's all in your noggin, my man. If you believe we're going to get caught, we're toast. -Oh, what do we do if they don't? Having a little fiesta back on my island after. I can put you on the list. and comprehensive group of dragons in the archipelago. I'm making it rain! It's raining gold. I knew I recognised him. He's a Dragon Rider. Seize them! Seize them all! Stormfly! Hookfang! Barf and Belch! Meatlug! Oh, I missed you, girl! I'm guessing that Berk will take quite the hit on his bottom line. This one will fetch a considerable price. Almost a pity to sell him, but I'll get over it. If you're good, I may even let you watch. Please, guards! Guards, don't you know who I am? They DO know who you are, which is why you are in here with us. -Hey, Gobber, what do you think these walls are made of? -It feels like iron ore. It's tough to run through. Sold to the Viking with no teeth! That's right, gentlemen. Your eyes do not deceive you. THE Night Fury. The only one in existence. The prize centrepiece of any collection. Get the boy. I want him to remember this moment. Oh, look out, you might get pebbled to death! -Ah, come on! Is that all you've got? -Give us your best shot. -Oh, no! It's the fat, lazy dragon! Help me, Grump. Please! Please, Grump! -That's it, Grump. Get 'em! -Is he ever going to learn? Everyone, to your dragons. Check the decks of the ships that are leaving. -I like the attitude, Fishlegs. Says the one-legged boy with no backup. and get Berk's gold back? Just a thought. He was fighting Ryker, but I don't see him. Turned tail after old Gobber taught him a thing or two. -He might have gotten in a few moves of his own. -He switched chests on me. -Well, let's go get him. That's a chest-half-empty point of view, Hiccup. Tuff, the chest isn't half-empty. It's totally empty of all of Berk's gold. It was worth it, Hiccup. Look at all the dragons we saved. I just hope my dad feels the same way. and we'll get that gold back. What? We shouldn't let it go to waste. Besides, this guy needs to eat constantly! -Look, everyone! My valet secured a dragon to call his own! Animated series based on How to Train Your Dragon. When the Riders uncover the location of Viggo's dragon auction, they must stop him from selling dragons and stealing all the gold in Berk.